Sustainable Food Systems from Agriculture to Industry: Improving Production and Processing addresses the principle that food supply needs of the present must be met without compromising the ability of future generations to meet their needs. Responding to sustainability goals requires maximum utilization of all raw materials produced and integration of activities throughout all production-to-consumption stages. This book covers production stage activities to reduce postharvest losses and increase use of by-products streams (waste), food manufacturing and beyond, presenting insights to ensure energy, water and other resources are used efficiently and environmental impacts are minimized. The book presents the latest research and advancements in efficient, cost-effective, and environmentally friendly food production and ways they can be implemented within the food industry. Filling the knowledge gap between understanding and applying these advancements, this team of expert authors from around the globe offer both academic and industry perspectives and a real-world view of the challenges and potential solutions that exist for feeding the world in the future. 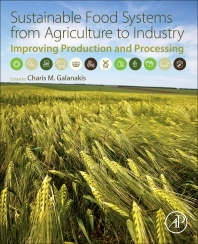 The book will guide industry professionals and researchers in ways to improve the efficiency and sustainability of food systems. Dr. Galanakis is a dynamic and interdisciplinary scientist with a fast-expanding work in food and environmental science and technology, innovation and sustainability, industry, and academia. He is the research and innovation director of Galanakis Laboratories (Chania, Greece) and the coordinator of the Food Waste Recovery Group of the ISEKI-Food Association (Vienna, Austria). He serves as an expert evaluator and monitor of international and regional funded programs and proposals, whereas he is an editorial board member and subject editor of Food and Bioproducts Processing and Food Research International. He has edited nine books from Academic Press: Food Waste Recovery: Processing Technologies and Industrial Techniques (2015), Innovation Strategies in the Food Industry: Tools for Implementation (2016), Nutraceutical and Functional Food Components: Effects of Innovative Processing Techniques (2017), Olive Mill Waste: Recent Advances for Sustainable Management (2017), Handbook of Grape Processing By-Products: Sustainable Solutions (2017), Handbook of Coffee Processing By-Products: Sustainable Applications (2017), Sustainable Food Systems from Agriculture to Industry: Improving Production and Processing (2018), Sustainable Meat Production and Processing (2019), and Separation of Functional Molecules in Food by Membrane Technology (2019), and three books from Woodhead Publishing: Polyphenols: Properties, Recovery, and Applications (2018), Sustainable Recovery and Reutilization of Cereal Processing By-Products (2018), and Innovations in Traditional Foods (2019).